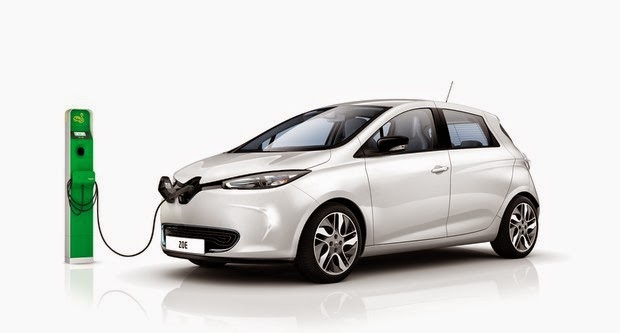 Renault’s subcompact electric car, the ZOE, has can recharge in 30 minutes, has an urban driving range of 90 miles, has an affordable price, and was named the Best Green Car of the 2012 Paris Motor Show. The Paris Auto Show has, for a few years, been a major showcase for electric vehicles. This year, the Renault ZOE won 51% of the vote required to be crowned as ‘Best Green Car of the 2012 Paris Motor Show’. The Renault ZOE is an aerodynamic electric car, with a very low price tag, flexible high powered charging system, and an electric driving range up to 90 miles. The ZOE was first shown as a concept car at the 2009 Paris Motor Show . It was positioned as an ultra compact urban car, capable of a 90 miles/hr top speed and driving range of up to 100 miles. 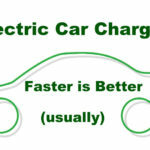 At that time Renault specified the charging times as 4-8 hour using a “level 2” charging station, or a high speed charging option giving a full recharge in under 30 minutes, or a 3 minute battery swap. Note that Renault is the primary partner of Better Place, who is building out a growing network of battery swapping stations in Israel, Denmark, Amsterdam, and next year in the San Francisco Bay Area. At the 2012 Paris Motor Show, Renault was able to show more details, as they prepare the car for it’s official launch later this year. With the ‘Range OptimiZEr’ system, Renault says the ZOE is designed to optimize real-world range under all driving conditions. For the driving range in “built-up areas” drivers can expect between 100-150 km (62-93 miles) of driving range. One expects that “built up areas” means city driving, and that driving range in highway conditions would be less. The Caméléon battery charger is the ZOE’s flexible charging system that automatically adjusts the charging rate to match the available power. Charging rate is anywhere between between 30 minutes and nine hours depending on the sort of power available at the charging station. The 9 hour charging time is via a 3 kilowatt normal AC (single-phase 240 volt) outlet, while the 30 minute charge time is available via a 43 kilowatt three phase electrical outlet. 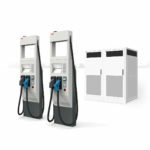 This charge rate, 43 kilowatts, is more than twice the theoretical limit of the J1772 charging cord used available in the U.S., however J1772 charging stations generally top out at 6-7 kilowatts. This makes the ZOE capable of fast charging via a method different from both the CHADEMO and SAE DC Fast Charging system. The advantage of the latter two systems is that the “rectifier” (AC to DC conversion) is located outside the car, but then those charging units are the size of a large refrigerator. Because the ZOE accepts three phase AC power, the AC-DC conversion is done on-board, and the whole unit must be much smaller than the typical CHADEMO station. 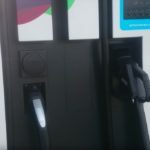 To accompany the Renault ZOE, the company is also launching a “massive roll-out of fast charging stations” that are claimed to be easier to use and up to four times more economical to run. The starting price for the Renault ZOE is €20,700 ($26,820), and in France the car qualifies for a €7,000 deduction ($9,069), making the starting price effectively €13,700 ($17,751). What’s not included in this price is the battery pack. Rather than sell the car and battery pack as a unit, Renault is leasing the battery pack separately from the car. 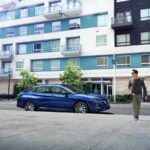 In March, Renault said the battery lease price would start from €79/month ($102/month) (for a contract covering 12,500km/year, 7,767 miles/year, over a period of 36 months). This lowers the up-front purchase price by spreading the cost of the battery pack over several years. The fast swap battery system is missing from the 2013 Renault ZOE. In its place Renault places the 43 kilowatt fast charge rate front and center, and in June the company staged a new world record for the longest distance traveled in 24 hours by a production electric car. A ZOE completed 363 laps of the Aubevoye speed ring in Normandy, a distance of 1,618 km (1005 miles) in a 24 hour period. This beat the former record of 1,280 km (795 miles) by 25%. Two ZOE’s were driven with a team of 15 drivers taking turns. Twenty-four hours later the cars had achieved 1,618 km and 1,506 km respectively of driving distance. This was made possible by the 43 kilowatt charging system, and the winning car received 18 fast charges in 24 hours. The ZOE sits squarely in the subcompact sphere, with a size similar to the Ford Fiesta. Its’ 0-60 miles/hr time of 8 seconds is speedy enough. It includes an in-dash infotainment system, the R-Link, that is powered by Android. The hardware is a 7 inch touch sensitive display, with a customizable home screen. By default six icons show up: Navigation, Multimedia, Phone, Vehicle, Services and Applications, and System. It’s not known how “open” the R-Link will be, because there are security concerns about installing apps in a car. However, Renault is starting an app store for the R-Link. In July, Renault confirmed rumors that the ZOE would be officially launched by the end of 2012 and would begin taking orders for this car during the Paris Auto Show. Renault is already selling three electric cars: Fluence ZE, Kangoo ZE and Twizy. 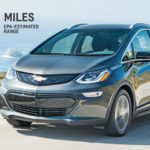 The company claims their market share of the global market in electric vehicles totaled 30% at the end of May 2012 and 54% in Europe at the end of June 2012.